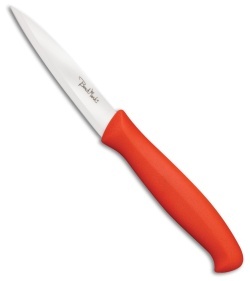 The Benchmark Ceramic Tomato knife is a wonderful to any kitchen cutlery set. Featuring a white zirconium oxide micro-serrated blade, the Benchmark Ceramic Tomato knife makes quick and precise work on any soft fleshed fruit or vegetable. The contoured red polymer handle is comfortable in hand and allows for precise control. Easily hand washed with warm soapy water.